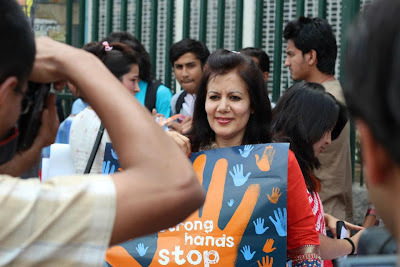 Considering the eve teasing and sexual harassment that are rampantly being promoted and is deep rooted in the Nepalese culture which is strictly against the law and is punishable act, we came together to raise our voices against these malpractices by creating awareness amongst people about the present laws, its consequences as well as the mental and emotional effect it has on victims. We chose to do a walk as that would be the most impactful way to disseminate the kind of information we wanted the public to know. 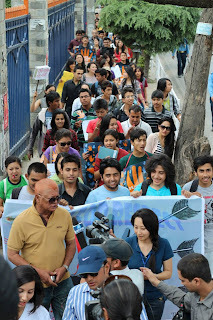 So, we did a gender neutral walk against sexual harassment and eve teasing on Saturday, 28th April 2012. 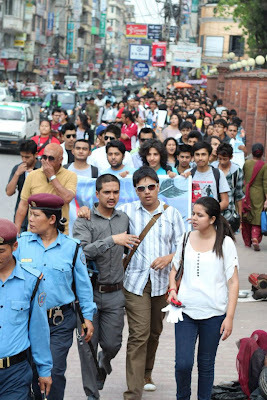 The walk commenced at 1 PM from NAC, when the chief guest singer Mr. Om Bikram Bista, a prominent figure in Nepalese music industry and Sunil Thapa, who has made his place as the bad boy of Kollywood, jointly cut the ribbon. Over three hundred people initiated the walk with a lot posters, banners and placards against eve teasing and sexual harassment. The whole walk didn’t disturb the vehicular movement or hampered the routine of the general public in any way as the walk was done entirely only in footpaths and over head bridges. This crowd of three hundred almost doubled in number during the whole walk. In addition, people were also given whistles to blow. This was to signify one of the future campaigns this walk is going to engender- The Whistle Campaign. Although the primary objective of the walk was to aware people about the laws against sexual harassment and eve teasing and the consequences on victims, the campaign also hopes to directly assess the problem if in case such activities happen in the future. 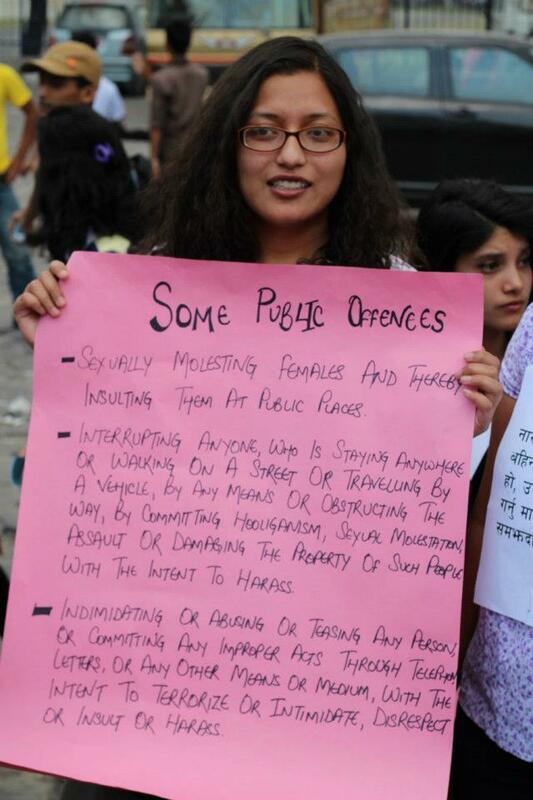 One way to do that is by making the whistle the primary weapon against eve teasing and sexual harassment. We plan to establish whistle as a standard code of harassment communication. If in any case, any one is harassed, the person can blow the whistle to attract the public attention which will shock and humiliate the culprits in first place and then it would be easy to take them to book. The final part of the walk comprised of a mass gathering of the people at Basantapur Durbar Square. We talked about the laws and what can be done as an individual to address these problems. We even disseminated information about the Poster campaign and the previously discussed Whistle Campaign. Very soon we will start sticking posters about laws against sexual harassment and eve teasing in public places and vehicles in order to aware more people about the issue and drastically decrease these evil deeds. 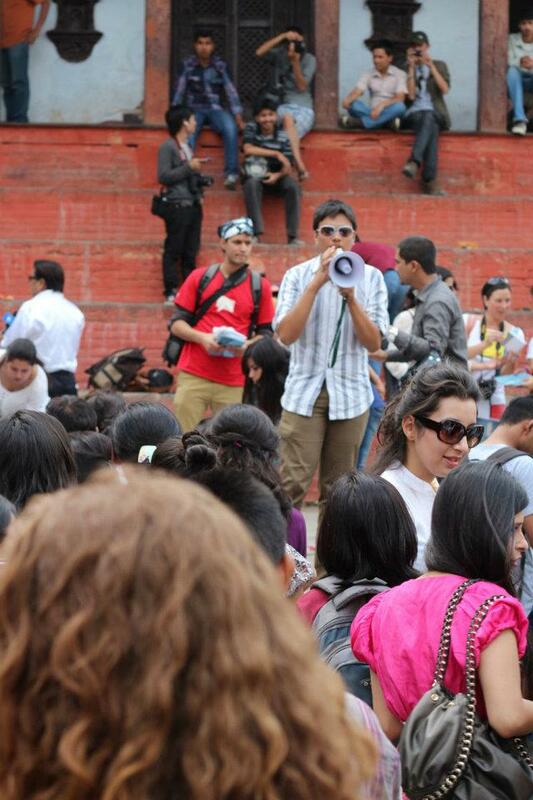 In addition, the walk also hope to do the whistle campaign, a direct means of fighting against sexual harassment. The mass gathering included slam poetries from Slok Gyawali and Ujwala Maharjun and ended with a melodious traditional song from Sarangi(song related to issues we are covering) which received huge accolades from the crowd. While people were expecting a concert at the end of the walk, everyone was happy with a short walk, slam poetry mash up and sarangi tunes and music. Overall the campaign reached out to a large number of people. We were overwhelmed by the interest and response we got from our participants. Everyone felt a sense of ownership towards the walk and greatly empathized with the cause. The best part of the walk was the presence of equal number of male and female participants which is a significant achievement and a good sign for the change we are trying to bring to our society. To sum it up, the campaign was a great success and it united people without any boundaries of gender, nationality, cast and many other things which itself is a great achievement for a cause, the cause to uproot eve teasing and sexual harassment for once and for all. Hope to have your support to completely eradicate these deep rooted evils being established as a cult from the face of earth. Prakrit Nepal is one of the organizers of Walk for Respect. He is an activist who was one of the organizers of Anti-Monsanto campaign and has been involved in national anti-corruption campaign "Bhrastachari lai kira paros", Hunger no longer and a couple of other campaigns. He is a aspiring volunteer as well.